President Filipe Nyusi and Renamo acting head Ossufo Momade met in Beira this afternoon and announced agreement on "military matters" and stressed their desire to resolve matters before the October local elections. (O Pais, Lusa and Noticias 11 July, all on-line) This should save the 10 October municipal elections. 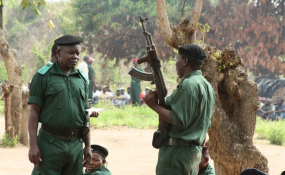 + Renamo will give a list of people to be incorporated into police and the army within 10 days. + Within 10 days government and Renamo will name people to the joint Military Affairs Committee and the technical groups. + Demilitarization begins at the same time. Momade has agreed to a submission of lists, a rapid start, and demonstrable progress before October elections. Nyusi has accepted the appointment of four commissions and thus that the actual demilitarization will take a long period of time. Momade told the press conference in Beira that he expects there will be a solution agreed "before October" elections, but he stressed that there is a sequence: "first is the framework, then integration, then demobilization and handing in of arms". Momade said that "we can now advance with integration of Renamo officers into the army (FADM)". He added that "in our conversation we arrived at agreement" that it is possible to incorporate Renamo fighters into the police and that a list of people would be submitted. Nyusi said that it had not been possible to integrate Renamo into the police in 1992 or 2014, "but it is now possible because Renamo has promised us a list." The security services SISE are not mentioned, but it is believed there may also be a secret agreement there. In our companion publication Mozambique Political Process Bulletin 2018 Local Elections (5 July, same editor, Joseph Hanlon) it was predicted that local elections could go ahead in October if there was a deal on military matters within two weeks - and it has happened in just one week. Constitutional amendments were approved on 24 May by parliament to end the direct election of mayors and instead specify that the head of the party list that receives the most votes for municipal assembly is automatically elected mayor. Legislation was tabled and a special session of parliament was scheduled for 21-22 June to approve it, but Frelimo forced the session to be cancelled and said nothing could happen without a military agreement. The National Elections Commission (CNE) said on 4 July that it could not move forward without a new law, and did not go ahead with acceptance of candidates for municipal assembly set for 5-27 July. Parties have, however, continued to prepare their lists and the CNE has moved on issues such as a tender for ballot paper printing, which meant both Frelimo and Renamo expected a deal. In the 5 July election Bulletin, it was argued that if a deal was reached within two weeks, the special parliament session could be held before the end of the month, and the period for acceptance of candidates could be cut to 10 days. That would allow the elections to continue on 10 October as planned, although it might make sense to delay until 17 or 24 October, which is still before the start of the rains. Copyright © 2018 Mozambique News Reports And Clippings. All rights reserved. Distributed by AllAfrica Global Media (allAfrica.com). To contact the copyright holder directly for corrections — or for permission to republish or make other authorized use of this material, click here.